Aluminum Steering Knuckles for Slash 4x4 (GM) Discounts Apply ! SPTST6837GM - Aluminum Steering Knuckles for Slash 4x4 (GM). Precision CNC machined from high-grade aluminum, our steering knuckle greatly improves durability and add that great factory looks to the front suspension of your Slash 4x4. Note: steering knuckle is marked with "L" and "R". 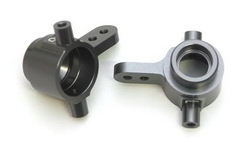 Please note our knuckles are designed to work with stock traxxas universal driveshafts. After market universals like the MIP will not work in our knuckle.